Posted on October 27, 2014 October 27, 2014 by JumpKing Trampolines, U.S. There is a lot to plan for the kids. Games and outdoor activities bring the best of fun and enjoyment to their vacations. From jumping on a home trampoline up to going for an exciting beach party, kids are always willing to take part in activities that help them to gather some of the most memorable moments. Capture those exciting moments, make it more playable for them by involving in the games they like, let them draw a beautiful scenery on the sand or just jump all day long with them on the home trampoline but don’t forget that besides everything your kids are always in need of an extra care for things they don’t know. Let us now quickly get into knowing about the basic outdoor safety tips for kids. While playing with your kids on the beach or in the pool, always remember that you should have a clear eye on what they are doing. Recent research shows that most of the kids losing lives in summer are considered to be a victim of drowning. The majority of people thinks that bounce houses are free to go for kids, but there are a number of reported kids’ injuries cases considering bounce houses. It doesn’t matter what you have provided them to play and have fun with, kids are always excited and they really don’t care about the safety tips. Do pay attention while they are jumping and tumbling. Drowning is one of the most prominent dangers considered to take the lives of hundreds of kids every year in the United States. As it happens in just a matter of a few moments, it is essentially important for you to always stay near them and be a wise water watcher for your kids. Feeling enough confident in your kids’ swimming skills is one of the biggest mistakes. Try guiding them about the extent they should go in the water and outline limits to the games they play. Never leave your younger kids to operate the water-crafts alone. Make them understand not to jump, push or fall back on others while playing in the water. Always outfit your kids with life jackets. Either they play on the beach or on the home trampoline; if kids are directly exposed to the sun circumstances are equally vulnerable. Global climate changes have resulted in direct exposure to the hazardous UV rays coming from the sun. UV rays don’t just cause sunburn and extra aches but several long term vulnerabilities. 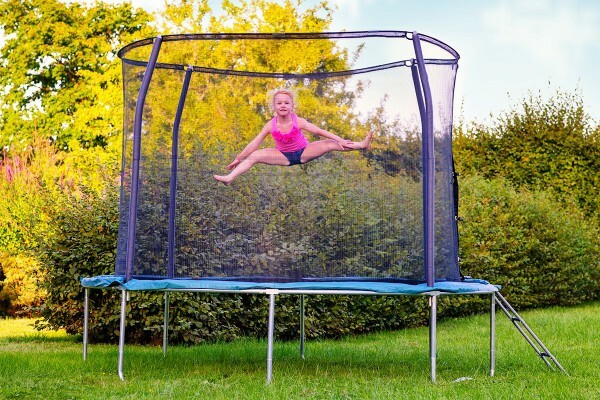 Try setting up your home trampoline in a place with less exposure to direct sunlight. Using sunscreen becomes vitally important. Most of the experts recommend applying sunscreen after every 20 minutes if your kids are playing on the beach. Affirmatively, while playing in the water, kids should apply waterproof sunscreen. While jumping and tumbling all day long, kids fully indulge in the game. Making sure they take sufficient amount of water throughout the day delivers greater prevention from dehydration. Taking energy drinks such as Gatorade etc. are the best possible sources of instantly gaining an adequate amount of carbohydrates into the body and rapidly re-hydrates the body.